I have Blue Brindle Japanese Akita called Sasha and this breed truely is amazing, big dogs with soft hearts. Hello UK! Sunny greetings from Svea and her family! Lovely to read such kind words in Your news! HUGS from us! I have a beautiful 11 month old male pinto. His name is Rocco and he is our pride and joy. He is our first akita and we are totally smitten with the breed. He is so loving and an excellent companion. We would like to get a female to keep him company as we have just recently lost our 12 year old german shepherd to whom he looked at as his mother. He is lost without her. Ideally we would love to find a long haired akita as we do not intend to breed, we just want to get Rocco a companion. Web site gets better each time I look. Your dogs are a credit to you. Congrats on Faith's best pup! She's looking great. I came across your website while looking for info regarding hair loss in my male 5 year old akita Gus. Your description of an Akita is Great! I enjoyed your photos and only wish I had room for more! 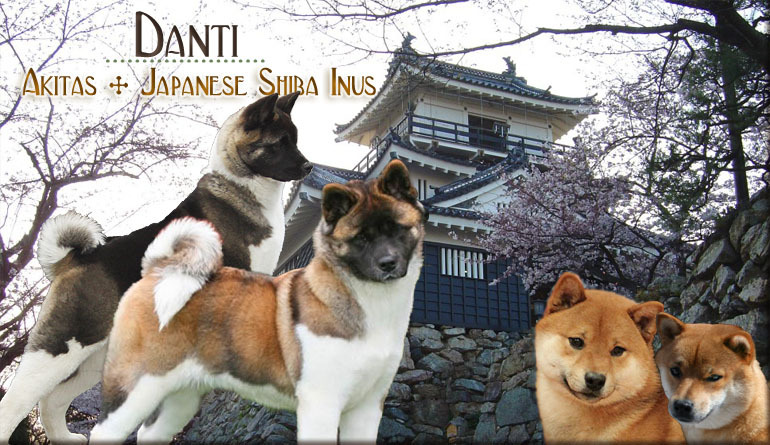 Your Akitas are absolutly gorgeous,i would love to purchase one of your male pups i have tried to send you an email but there is a servo error,i would really love to hear from you.